Jeff Lynne is currently having a bit of a “second coming” as a national hero. More than 40 years after forming the Electric Light Orchestra with Wizzard’s Roy Wood, Lynne’s brought one of the most successful bands back out of retirement after more than 10 years since their last outing. Alone in the Universe, was inspired after a mesmerising revival gig at Hyde Park last September. Over 50,000 crammed into Radio 2’s Festival in a Day, to see Jeff, trademark afro and aviators included, play hit after hit to a rapturous crowd. Lynne has said that the experience inspired him to get back into the studio and create a new album. Now billed as “Jeff Lynne’s ELO”, the new album is a collection of 10 delicately crafted, self-produced 3 and a half minute pop gems. With Lynne’s characteristic production in tow after working with the likes of Tom Petty, Roy Orbison and even the Beatles, each song soars, dips and dives as any ELO fan would expect. 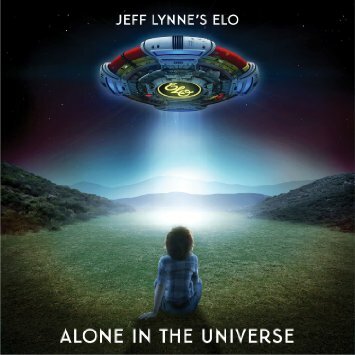 For new listeners, Alone in the Universe will come across as some sort of vintage revival, but for the seasoned fan, ELO were all about creating music that was futuristic and a bit weird, and this album deviates from the formula slightly, but that’s only because of the topic of writing on Lynne’s mind -his youth. By no means wordsmiths, ELO present their most direct lyrics with ‘When I Was a Boy’. Akin to Lynne flicking through a photo book of his life, we hear about him learning to play guitar as a kid, and how the radio kept him company. It’s not complex or subtle in its delivery, but it does work extremely well as a Beatles-esque album opener. Other flourishes on the album show signs of the old ELO, with its new snazzy synth driven orchestra and its piano driven melody, ‘The Sun Will Shine on You’ sounds like something you would have heard U2 or Coldplay put out. Whilst ‘Ain’t It a Drag’ is a real Traveling Wilbury’s inspired rocker, keeping this album from plodding along at a mundane pace. This album is (thankfully) not Lynne doing a victory lap; he keeps things exciting throughout. As a huge fan it’s difficult to rate Alone in the Universe anywhere but extremely highly. With melodies and no expense left production values crammed into every nugget of this album, it’s a great listen. It’s by no means fresh, but if you enjoy the likes of Tame Impala, who goldmine the best bits of bands like ELO and warp them into 2015, give the original a listen too. Posted in Music and tagged album, ELO, Music, review. Bookmark the permalink.